Since we are constantly to and fro-ing, it seems like we exist in semi-constant eat-down mode. A great dish for leftovers and bits and pieces is fried rice. John made this from leftover white rice from Sunday’s Chinese take-out, the remnants of the flank steak from last night as well as the green beans, a little turkey sausage from a lentil stew, some tired mushrooms, and whatever other vegetables existed in the crisper. He also scrambled up an egg and used soy sauce and sesame oil for flavor. 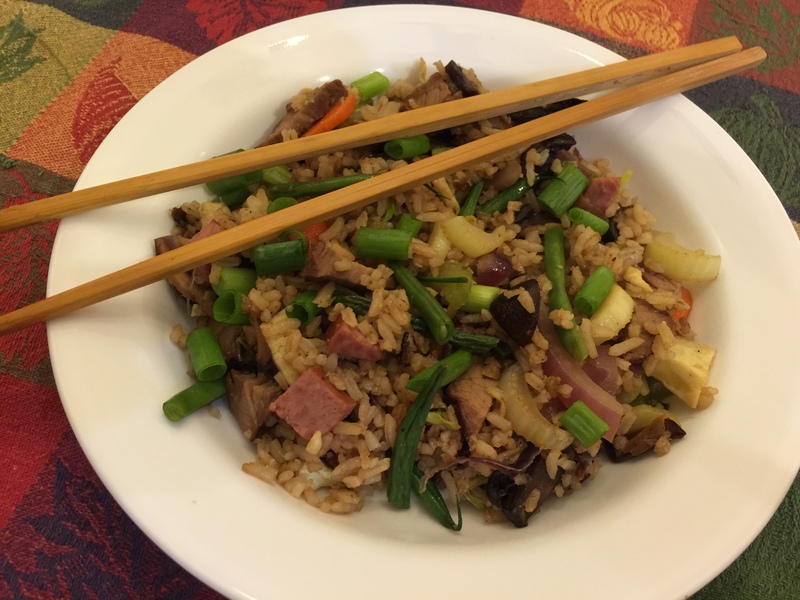 This entry was posted in Beef, Eggs, leftovers, Poultry, Vegetables and tagged carrots, Celery, Eggs, flank steak, Fried rice, mushrooms, Onions, rice, turkey sausage, Vegetables. Bookmark the permalink.